After the Board of Trustees visit, President Cornwell gave updates on strategic planning, the financial overview of the school, ongoing and upcoming capital projects, upcoming upheavals and displacements, and on recent major gifts to Rollins’ capital campaign. During the strategic initiative update, Dr. Toni Holbrook of Strategic Planning elaborated on the institution’s goals for the extended future: to deepen student engagement with the college’s mission, to deliver on the school’s promise of student success, and to steward the school’s strategic assets to strengthen its competitive advantage. Dr. Holbrook explained the dynamic nature of Rollins’ planning process and the effects that it has on ongoing projects. In May of 2017, Strategic Planning was involved in 65 initiatives. But, through the dynamic planning process, these initiatives have been revised and consolidated down to 51. Since October, the school has undertaken two new initiatives. The first being to establish a Rollins proof project, which will demonstrate the extent to which the college fulfills its mission. The second new initiative is the construction of a new facility for the Department of Theatre and Dance, which will replace the existing Fred Stone theatre, dance studio, and costume shop. The new facility will also provide classroom space for the theatre and dance students. In addition, Dr. Holbrook gave an update on the school’s progress towards making the slogan, “making tomorrow happen,” a reality. According to the planning office’s metrics and calculations, as of January 2018, it had completed 37 percent of its stretegic initatives. Of the 51 current initiatives, four are 100 percent complete; 18 are 50-80 percent complete, 23 have some action items completed, and six have yet to be started. An update on the 12 major capital projects currently under or awaiting construction was given by Head of Facilities Scott Bitikofer. New among these capital projects are the mechanical renovation of Cornell Hall for the Social Sciences, the moving of Campus Security to the current costume studio, and the demolition of Chase Hall. In order to help the faculty during this hectic time of renovation and construction, Strategic Planning has put together a Logistics and Communications cabinet. Sitting on the cabinet are representatives from Academic Affairs, Student Affairs, Facilities Management, Business Services, Marketing and Communication, Human Resources, Information Technology, and Strategic Planning. The cabinet also includes liaisons for every major building project. The liaisons are Micki Meyer for the Mills renovations; Meghan Weyant for the new residence hall; Dexter Boniface for the CSS renovation, and Jenny Cavenaugh for the theater projects. Newly tenured faculty were also announced at the meeting. In the College of Liberal Arts, these faculty members were Amy Armenia, Kevin Griffin, Jonathan Harwell, Anne Murdaugh, Timothy Pett, Kasandra Riley, and Jie Yu; and in the Crummer Graduate School, Keenan Yoho received tenure. As well as gaining tenure, Amy Armenia of the Department of Sociology and Timothy Pett of the Department of Business were made chairs of their respective departments. In other faculty developments, Richard Lima, associate professor of French, and Craig McAllaster, professor in the Crummer Graduate School of Business, were both elevated to Emeritus Status. At the end of the meeting, President Cornwell expanded upon the relatively new concept of the innovation triangle at Rollins. 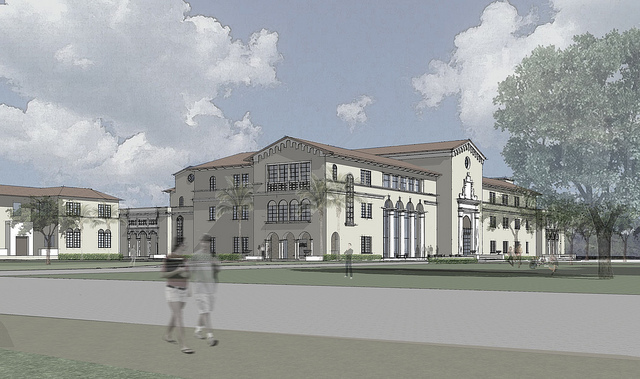 Cornwell described this initiative as “a narrative wrapped around three projects.” These three projects are the expansion of the Alfond Inn, the expansion of the Cornell Fine Arts Museum, and the expansion and modernization of the Crummer building.